The history of innate alloimmunity begins in 1994 with the publication of clinical data from the Munich superoxide dismutase trial, which suggests that renal allograft reperfusion injury initiates acute allograft rejection and contributes to the development of chronic rejection. This clinical observation led to construction of an Injury Hypothesis. By 2007, growing evidence in favor of this hypothesis was seen. In particular, there was increasing experimental evidence in support of the notion that an oxidative allograft injury leads to generation of damage-associated molecules, such as heat shock protein 72, high mobility group box 1, and a hyaluronan fragment, all of which act as endogenous ligands of Toll-like receptors. These molecules are recognized by intragraft donor-derived and recipient-derived, Toll-like receptor 4- and Toll-like receptor 2-bearing dendritic cells that mature and subsequently initiate cytokine-driven development of the recipient’s adaptive alloimmune response. Initial evidence suggests that injury-induced, Toll-like receptor-triggered signaling pathways involved in establishing innate alloimmunity utilize adaptor proteins and transcription factors that play a crucial role in the host’s defense against pathogens. The first clue to the existence of innate alloimmunity came from clinical observations made during the Munich superoxide dismutase (SOD) trial published in 1994 . In that prospective, randomized, double-blind trial, a beneficial effect of the free-radical scavenger SOD was observed on both acute and chronic rejection events in kidney-transplanted cyclosporine-treated patients. Patients who received a single intravenous injection of SOD during surgery experienced a statistically significant reduction in the incidences of acute rejection episodes and acute irreversible graft rejection. In addition, those SOD-treated patients showed a statistically significant improvement in long-term outcomes, an effect that could be demonstrated 8 years after the initial administration of the SOD. Since experimental data to explain these observations are lacking, we posed a working hypothesis, the Injury Hypothesis. This hypothesis holds that reactive oxygen species (ROS)-mediated reperfusion injury to an allograft, in addition to its degree of foreignness, initiates and induces the adaptive alloimmune response (ie, acute rejection) predominantly via activation of antigen-presenting cells (APCs). Furthermore, we discussed the possibility that ROS-induced injury contributes to the development of alloatherosclerosis of the donor organ vessels (ie, chronic rejection) via injury–induced proliferation of smooth muscle cells [1, 2]. A role for injury–up-regulated costimulatory molecules on APCs, as suggested by the coincident expression of adhesion molecules, also was noted . In 2002 and 2003, following the rediscovery of innate immunity, we modified and extended the Injury Hypothesis. We reviewed data that supported the concept that ROS-mediated injury to allografts (occurring in the donor during brain death and in the recipient during allograft reperfusion) activates the innate immune system of both the donor and the recipient [4-7]. In particular, we discussed a double role of ROS. First, ROS, operating as toxic molecules, induce not only necrosis but also cell alterations as indicated by the intracellular appearance of nonnative oxidized proteins that induce the chaperoning activity of heat shock proteins (HSPs); HSPs are recognized by Toll-like receptor 4 (TLR4)-bearing cells of the innate immune system resulting in their activation. Secondly, ROS (acting as second messenger molecules and potentially contributing to posttranslational modifications) may facilitate Toll-like receptor (TLR)-triggered, myeloid differentiation marker 88 (MyD88)-dependent signaling pathways, resulting in activation of the transcription factors, nuclear factor kappa B (NF-κB), and activator protein-1 (AP-1). In these reviews, and with Polly Matzinger, we coined the term DAMPs (meaning damage-associated molecular patterns) to describe molecules arising in injured allografts and representing the endogenous ligands of TLR4. Injury-induced, mature, TLR4-bearing, donor-derived and recipient-derived dendritic cells represent the bridge to subsequent activation of the adaptive alloimmune response of the recipient, whereas activation of donor-derived TLR-bearing vascular cells of the innate immune system contribute to the development of alloatherosclerosis, which in turn, may result in development of chronic rejection. Ultimately, we concluded that the early and late fate of an allograft is predominantly determined by its continuous exposure to a variety of different stressful factors causing graft damage. Oxidative stress to allografts appears to be the most important stress factor, whereas chronic conditions of the recipient such as hypertension, hyperlipidemia, viral infections, and the daily administration of organ-toxic immunosuppressive agents are supposed to mediate continuous but milder stress. During recent years, we have seen growing experimental and clinical support for the Injury Hypothesis, even strikingly for several selected points. Some of the new data concerning the development of acute rejection are briefly discussed below. Every solid allograft is a reperfused organ. As previously reviewed , numerous investigators have studied several models of experimental organ transplant to prove a role for ROS in postischemic reperfusion of autografts and allografts. Particularly, experimental studies of cold-preserved kidney, heart, and lung transplants provide direct and indirect evidence in support of the hypothesis that the whole process of organ procurement, cold-storage, and reimplantation is associated with considerable postischemic reperfusion injury of the transplanted organ mediated by ROS. Hence, recent research on experimental models of ROS-mediated reperfusion injury is critical to interpret innate immune events during allogeneic organ transplant, that is, innate alloimmunity. This research suggests that the reperfusion injury-induced destruction of an allograft reflects a multifactorial process initiated by a primary direct oxidative tissue attack resulting in the generation of DAMPs. Subsequently, innate cells (eg, DCs and lymphocytes) as well as innate humoral factors (eg, complement and pre-existing natural IgM antibodies) are activated, leading to inflammatory innate isoimmune events and adaptive alloimmune processes (Figure 1). Some of those innate immune events are described in more detail below. Our proposal that ROS play a double role in activating the innate immune system is supported [8,9]. Notably, the innate immune response is proposed to be shaped like an hourglass. The top of the hourglass is wide, indicating that 10 human TLR proteins recognize a large variety of pathogen-associated molecular patterns (PAMPs) and DAMPs. Then, the hourglass narrows to represent a smaller number of 4 adaptor proteins and even fewer initial kinases, and then it widens again to reflect involvement of more than 10 activated distal kinases followed by activation of master transcription factors including NF-κB, AP-1, and interferon regulatory factor 3 (IRF3), which in turn, activate more than 500 genes [10, 11]. However, the hourglass may not be so narrow at its center, owing to the involvement of ROS. Long before discovery of the innate immune system, ROS-mediated reperfusion injury was shown to activate acute-phase response transcription factors such as NFkB and AP-1 (reviewed in  and ). Indeed, recent experimental studies (including studies on sepsis in nuclear factor erythroid 2-related factor 2 (Nrf2)-deficient mice) support the notion that the hourglass also may be wide at its center. Many of the kinases active downstream of TLR4 signaling—for example, interleukin-1 receptor-associated kinase, kB kinase (which leads to more rapid nuclear translocation of NF-κB, such as that which is responsible for DC maturation), and kinases involved in the TIR-domain containing adaptor-inducing INF-β (TRIF)-IRF3–mediated gene transcription—can be regulated through ROS, probably via oxidant (redox)-dependent posttranslational modifications that result in an additional level of control of TLR signaling [9, 12, 13] (Figure 2). In fact, it has already been shown that redox-dependent control of TLR4 signaling stems from the fact that many of the kinases, transcription factors (such as NF-κB and AP-1), and subsequent gene products induced by the microbial TLR4 ligand lipopolysaccharide (LPS) can be posttranslationally modified by ROS [14, 15]. It is well recognized that postischemic reperfusion injury, according to its gradually increasing strength, is associated with either cell alteration (eg, appearance of oxidized proteins), and/or apoptosis, and/or necrosis, as well as damaged extracellular matrix compounds. Accordingly, DAMPs may be either actively secreted from stressed, slightly damaged cells, and/or released from apoptotic or necrotic cells, and/or consist of fragments of injured extracellular matrix compounds (Figure 3). In apoptosis, several biochemical reactions trigger a cascade of events that activate caspases, including initiator caspases (eg, caspase 8) and effector caspases (eg, caspase 3) [16-18]. As a result of molecular therapy in mice, the critical role of caspases in mediating reperfusion injury was recently documented. In that experiment, renal ischemic injury could be prevented by silencing the expression of renal caspase 3 and caspase 8 . Actively secreted and/or released DAMPs include the inducible heat shock protein 70 (HSP72) and high-mobility group box 1 (HMGB1), whereas hyaluronan fragments (fHA) represent DAMPs derived from injured extracellular matrix compounds. These different damage-induced, danger-signaling molecules have been recognized as endogenous ligands of TLR4 and TLR2. The following provides more detail. Heat shock proteins: HSPs, such as HSP72, regularly induced by reperfusion injury, have been described as endogenous ligands for TLRs . Evidence from different laboratories suggests that the effect of HSP-mediated activation of professional APCs depends mainly on the presence of functional TLR4, and to a lesser extent, also TLR2 molecules. This finding raises concerns as to whether or not HSP molecules themselves or HSP-contaminating LPS are responsible for the effects observed. Meanwhile, reports have been published strongly suggesting that (1) TLR4-mediated hepatic reperfusion injury is not triggered by LPS but by endogenous ligands , and (2) that HSPs definitely amplify DC activation under ligation with TLR4 and TLR2 and induce “danger signals” through their interaction with APCs [21, 22], although in thoso experiments, minimal concomitant LPS contamination was shown to contribute slightly to the inflammatory responses. HMGB1: Much attention has been drawn to a newly discovered DAMP, the nuclear factor HMGB1. This molecule is a DNA-binding protein that plays a critical role in regulating gene transcription. Notably, data have been published indicating an important role for oxidative stress in inducing active and passive HMGB1 release from macrophages and monocytes, potentially through a mitogen-activated protein kinase (MAPK)- and chromosome maintenance region 1 (CRM1)-dependent mechanism . In accordance with this finding, HMGB1 acts as an early mediator of inflammation and organ damage in hepatic ischemia reperfusion injury. HMGB1 levels are increased during liver reperfusion injury as early as 1 hour after reperfusion and then increase in a time-dependent manner up to 24 hours . The molecule can induce activation and migration of human dendritic cells  as well as activate human smooth muscle cells . Thus, like HSP72, HMGB1 represents a DAMP that can promote allograft rejection and contribute to the development of alloatherosclerosis, both of which are known to be influenced by allograft reperfusion injury. There is a differential use of TLR4 and TLR2 in HMGB1 signaling in primary cells adding complexity to studies of HMGB1 signaling . Monitoring HMGB1 in the serum or plasma with sandwich ELISA may be useful to specify and quantify reperfusion injury to human allografts . Hyaluronan fragments: Hyaluronan fragments (fHA) are endogenous indicators of tissue injury and part of the group of DAMPs. They are important structural components of the extracellular matrix, a common component of bacterial surfaces. fHA are generated during reperfusion injury  and have been shown to activate DCs via binding to TLR4 and TLR2 [30, 31]. As predicted in 2002 , there is now ample evidence that TLR4 mediates oxidative tissue injury. In fact, there is no doubt anymore that experimental, full-scale, reperfusion-induced tissue injury, an innate immune-dominated inflammatory response, is mediated, at least in part, by activation of TLR4-, and probably also of TLR2-bearing, cells. This has been demonstrated in hepatic, myocardial, renal, pulmonary, and cerebral reperfusion injury models. In an experimental model of liver reperfusion injury in TLR4-, MyD88-, and IRF3-deficient mice, full-scale liver reperfusion injury was shown to be initiated and induced by activation of TLR4 . That study further showed that reperfusion injury activates TLR4 through an MyD88-independent, but IRF3-dependent, pathway to induce the chemokine interferon-g-inducible protein-10 (IP-10), which may then be responsible for recruiting and activating T cells. A subsequent study in a hepatic reperfusion model showed that TLR4 engagement on actively phagocytic nonparenchymal cells (eg, Kupffer cells) is required for warm ischemia-reperfusion-induced injury and inflammation in the liver . Another study  examined the mechanism of innate immune-induced T-cell recruitment and activation in a rat syngeneic orthotopic liver transplantation model. That study demonstrated a novel mechanism of T-cell recruitment and function in the absence of exogenous antigen stimulation. In that experiment, execution of innate immune function was shown to require CXCR3+CD4+ T cells, an observation that highlights the critical role of CXCR3 chemokine biology for the continuum of innate to adaptive immunity in the pathophysiology of hepatic reperfusion injury. Of further interest are studies using a murine isogeneic orthotopic liver transplant model. Those studies showed that absence of TLR4 signaling in the donor organ reduces ischemia and reperfusion injury in transplant recipients . Similar results have been obtained in studies in another TLR4-deficient mouse model of partial hepatic ischemia /reperfusion injury. In those experiments, only a small amount of endotoxin was detected in the portal vein, suggesting that activation of TLR4 is not due to an increase of endotoxin in the circulation (LPS pathway) of the model used . In a murine model of myocardial ischemia-reperfusion injury, which used 2 strains of TLR4-deficient mice, TLR4-deficient mice were shown to sustain smaller infarctions and exhibit less inflammation after myocardial reperfusion injury . Further, in studies in rats, postischemic reperfusion injury to the kidneys has been reported to rapidly activate the innate immune response associated with up-regulation of TLR2 and TLR4 mRNA as well as protein expression; this was observed mainly on renal tubular cells . Other experiments have shown reduced ischemia-reperfusion injury to the lungs and cerebrum in TLR4-deficient mice [39, 40]. A more-recent study defined the constitutive protein expression of TLR2 in human and mice kidneys, and provided insight into the signaling mechanisms by which ischemic organ injury is protected by a deficiency of TLR2 . In that study, the absence of TLR2, MyD88, and MyD88xTRIF conferred both physiological and histological protection against sublethal ischemia at 24 hours suggesting that the TLR2 protein, constitutively expressed in the kidney, plays an important role in the pathogenesis of acute ischemic injury by signaling both MyD88-dependent and MyD88-independent. As mentioned, long before the discovery of the innate immune system, ROS-mediated reperfusion injury had been shown to activate proinflammatory master transcription factors such as NFkB and AP-1 (reviewed in  and ). As pointed out above, in an experimental model of liver reperfusion injury in TLR4-, MyD88-, and IRF3-deficient mice, reperfusion injury was shown to activate TLR4 through an MyD88-independent, but an IRF3-dependent, pathway to induce the chemokine IP-10, which may then be responsible for recruiting/activating T cells . In similar experimental studies on the model of hepatic ischemia/reperfusion injury in TLR4-mutant mice, TLR4 signaling in nonparenchymal phagocytic cells was shown to involve activation of NF-κB and c-Jun-N-terminal protein kinase (JNK) as a subgroup of MAPKs . Taken together, there is growing evidence suggesting that allograft reperfusion injury activates the 3 proinflammatory master transcription factors NF-κB, AP-1, and IRF3 that are responsible for secreting cytokines and chemokines and up-regulating costimulatory and adhesive molecule expression and thus, appears to be involved in initiating innate alloimmunity. Interestingly, recent experimental work suggests that the IRF3-dependent secretion of type-1 interferons is substantially involved in the early phase of liver ischemic reperfusion injury . Besides innate immune cells, humoral factors (such as complement and highly conserved monoclonal IgM antibodies) represent classic tools of the innate immune system. Interestingly enough and according to recent investigations, postischemic reperfusion injury appears to activate complement via the mannose-binding lectin (MBL) pathway, which then may contribute to additional tissue injury. Activation and involvement of the complement pathway, mediated by MBL, in experimental and clinical renal allograft reperfusion injury has already been shown . Recent studies of intestinal, skeletal muscle, and heart ischemia reperfusion injury models show that reperfusion of ischemic tissues elicits an acute inflammatory response involving the serum complement system, which is activated by natural IgM [44, 45]. Identification of a monoclonal natural IgM that expands the ROS-initiated reperfusion injury led to identifying nonmuscle myosin heavy chain type-II A and C as the self-targets in 2 different tissues. New evidence further suggests that IgM binds initially to the “ischemic” antigen (neoantigen) providing a binding site for MBL that subsequently leads to activation of complement and results in tissue injury. Therefore, natural IgM-mediated innate autoimmunity (nb: “innate isoimmunity” in the allograft reperfusion setting) is likely responsible for the full-scale tissue injury in reperfusion injury-mediated diseases . In fact, research in mice treated with siRNA has demonstrated the considerable impact of an “innate” activated complement involved during reperfusion injury. In those experiments, treatment with small interfering RNA by targeting a complement 3 gene or a complement 5a receptor gene prevented renal ischemia-reperfusion injury [46, 47]. DCs play a dominant role in injury-activated innate immune events. Importantly, however, the TLR-mediated DC maturation as a prerequisite for initiating an adaptive immune response is not the only cell-maturing mechanism. Recent studies have shown that innate lymphocytes (ie, natural killer, natural killer T, and γδ T cells) trigger DC maturation following detection of either pathogen-derived antigens or injury-induced neoantigens in terms of altered self-antigens, for example, on stressed self-tissues (such as heparan sulfate, proteoglycans, glycolipids, and HSPs) . Their activation leads to the secretion of proinflammatory mediator substances as well as to DC maturation by a combination of cytokine- and cell-to-cell contact-dependent signals. In turn, matured DCs, in terms of cross-talk, may not only expand the function of innate lymphocytes but also, via processed antigens released from cells killed by innate lymphocytes, may elicit an adaptive immune response . Interestingly, all 3 types of innate lymphocytes have been shown to infiltrate reperfused tissues [49- 51]. In addition, DAMPs such as HSPs and HMGB1 have been reported as activating these innate lymphocytes [52, 53]. Taken together, reperfusion-injury-induced intragraft infiltration of innate lymphocytes may play a critical role in innate alloimmune mechanisms initiating allograft rejection. Surprisingly, few experimental studies have been performed in the field of innate immune events preceding an adaptive alloimmune response leading to allograft rejection. If we accept the concept that the postischemic allograft reperfusion injury activates both donor-derived and recipient-derived, TLR4- and TLR2- bearing DCs, which, as matured cells, initiate adaptive alloimmunity, then the question remains: What endogenous innate immune agonists (ie, DAMPs) induce what TLR4-/TLR2-triggered signaling pathways leading to DC maturation that result in the initiation of innate alloimmunity? To address this issue, 3 types of experiments have been performed so far to (1) identify the nature of innate immune agonists, (2) perform skin transplants in mice deficient of distinct innate signaling molecules, and (3) pretreat allograft-recipient mice with donor-derived tolerogenic DCs generated in vitro via gene silencing of transcription factor NFkB. In fact, experimental evidence already exists demonstrating that HSP72 and HMGB1 act as DAMPs, that is, as TLR agonists, in innate alloimmunity. Thus, it could be shown that targeted gene disruption of the hsp72 gene in donor tissue is associated with significantly prolonged rejection-free survival in the murine skin allograft model . The nuclear factor HMGB1 seems to be another DAMP not only involved in reperfusion injury but also in developing innate alloimmunity. In experiments in mice, HMGB1 has been shown to function as an innate immune-mediator implicated in murine cardiac allograft acute rejection as demonstrated by prolonged allograft survival in recipients treated with a self-made HMGB1 antagonist (rA-box) . Further, in a murine in vitro culture system, 135 KDa fragments of the extracellular matrix glycosaminoglycan (fHA) were shown to induce dendritic cell maturation and initiate alloimmunity . In that study, priming of alloimmunity (allogeneic T cells) by hyaluronic-activated DCs depended on signaling via the adaptor protein TIR-associated protein (TIRAP). In those experiments, TLR4 was the TLR largely responsible for the alloimmune priming ability of fHA-treated DCs. 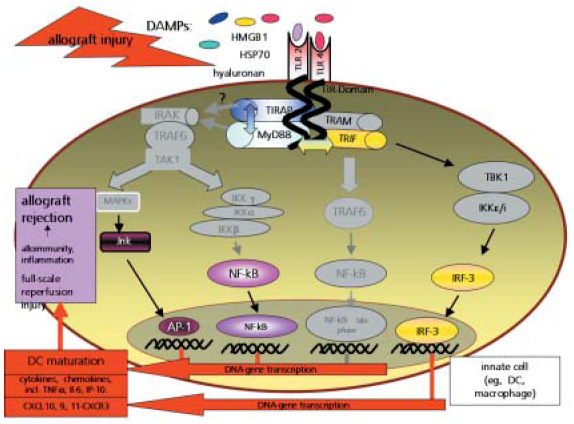 If the concept of innate alloimmunity is correct, adaptor molecules such as MyD88 and TRIF should be involved in the development of rejection. In fact, experimental data already are available to support this concept: Skin grafts from MyD88-deficient donors have been shown to survive indefinitely when transplanted across the very weak minor histocompatibility barrier H-Y , but a deficiency in MyD88 has no effect across a strong major histocompatibility complex (MHC) barrier . In another study, donor tail skin from wild-type, MyD88-deficient, TRIF-deficient, or MyD88- and TRIF-deficient mice was transplanted onto BALB/c (H-2d) recipients . Recipient mice differed from wild-type, MyD88-deficient, or TRIF-deficient donors by both major histocompatibility and by minor antigens. In that study, absence of both MyD88 and TRIF adapter proteins was demonstrated to prolong skin graft survival, notably across a complete MHC and minor antigen barrier. Absence of MyD88 or TRIF alone only had a modest effect on graft survival across even a minor MHC antigen difference. Prolonged survival of skin grafts from mice deficient in both MyD88 and TRIF was associated with diminished migration of donor cells to draining lymph nodes and subsequently, with delayed infiltration of host T cells into the grafted tissue. This finding that the simultaneous absence of MyD88 and TRIF signaling led to prolonged graft survival, suggests that the family of TLR of donor origin contributes significantly to host recognition of allogeneic tissue. The fact that, in this model, indirect allorecognition through recipient-derived, fully TLR-efficient, dendritic cells is still operating, may explain why TLR-deficient skin is still rejected. In addition, in another study mentioned above , priming of alloimmunity by fHA-activated DCs depended on signaling via the adaptor protein TIRAP downstream of TLR4 and TLR2. However, this effect was shown to be independent of alternate TLR adaptors, MyD88 and TRIF, indicating, at least in this setting, that TIRAP and MyD88 act in functionally distinct pathways. RelB, an NF-κB family member, is a key molecule controlling DC maturation. Accordingly, NF-κB must be regarded as a key transcription factor involved in mDC-mediated innate alloimmunity. In this context, a study was designed to generate DCs, in which the RelB gene is silenced, to prevent graft rejection . In this experiment, cultured DCs from the donor-derived strain C57/BL6 were silenced using RelB short interfering RNA. Silencing RelB resulted in arrest of DC maturation, evidenced by inhibited expression of MHC II, CD40, CD80, and CD86. Inhibitory effects of RelB-silenced DC on alloreactive T cells could be demonstrated and were due to expansion of CD4+CD25+ T-regulatory cells. RelB-silenced DCs also displayed strong in vivo immune regulation. Thus, administration of donor-derived RelB-silenced DCs significantly prevented allograft rejection in murine heart transplants. RelB-silenced DC-mediated allotolerance was shown to be associated with in vivo T-regulatory cell augmentation. In fact, that study demonstrated, for the first time, successful induction of allotolerance using in-vitro–generated tolerogenic DCs via RNA interference. Taken together, the experiments outlined above support the concept that initial allograft injury, canonically reflected by reperfusion injury, initiates an innate immune response by activating innate immune cells (such as donor-derived and recipient-derived TLR-bearing DCs and innate lymphocytes) as well as humoral factors (complement, natural IgM antibodies). Subsequently, this acute intragraft inflammatory innate immune/isoimmune response results in initiating and expanding the adaptive alloimmune response where the strength of the different MHC antigens involved comes into play for the first time. 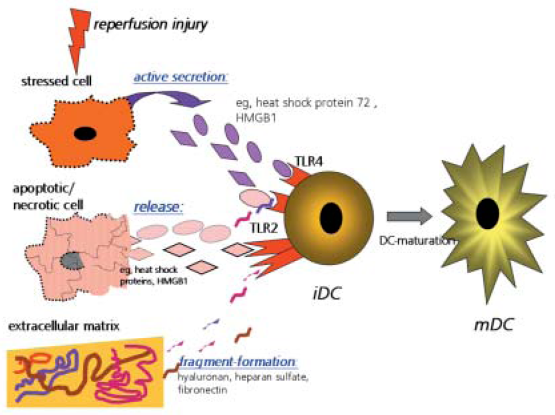 Regarding the experimental data currently available, the following concept of allograft injury-induced innate alloimmunity may be discussed (Figure 4): Oxidative allograft injury in the brain-dead donor and in the recipient during reperfusion is associated with generation of DAMPs such as HSP72, HMGB1, and fHA, all of which are recognized by TLR4 and/or TLR2. Subsequent TLR4- and TLR2-triggered signaling pathways utilize adaptor proteins including MyD88, TIRAP, and TRIF, which appear to associate with one another, and probably in terms of intense cooperation, initiate downstream signaling pathways that lead to activating the 3 master transcription factors NF-κB, AP-1, and IRF-3. NF-κB seems mainly to be responsible for maturation of donor-derived and recipient-derived dendritic cells, which represents the bridge to development of an adaptive alloimmune response that results in rejection. Silencing this transcription factor in transplant models may even lead to allotolerance induction. Nevertheless, the “road map” of the signaling pathways/molecules leading to allograft rejection is incomplete. Many questions for the future of transplant research work must be solved such as: In terms of endogenous innate immune agonists, are other DAMPs involved? Are there TIR-independent molecular pathways critical for developing innate alloimmunity, for example, are they triggered by pattern recognition receptors other than TLRs, such as nucleotide-binding and oligomerization domain like receptors and retinoic acid-inducible gene I-like receptors? Regarding the complexity and variety of innate immune pathways that can lead to allograft rejection, much redundancy can be expected in the field of innate alloimmunity. In fact, the molecules discovered so far may not only cooperate synergistically (eg, MyD88-TRIF) but may be part of a more complex molecular network of signaling pathways that regulate a tailored adaptive alloimmune response depending on the type and intensity of the allograft injury, the subsequent generation of different types of DAMPs, and the various major and minor histocompatibility antigens involved. In view of this complex molecular network, transplantologists may be advised to search primarily for innovative ways to prevent the initial oxidative allograft injury rather than to look for agents that can interfere with single molecules involved in so many innate signaling pathways . Land W, Messmer K. The impact of ischemia/reperfusion injury on specific and non-specific, early and late chronic events after organ transplantation. Transplantation Rev 1996; 10: 108-127 and 10: 236-253. The data presented here were presented as a lecture at the first Congress of the Society of Innate Immunity, Ankara, Turkey, May 13-16, 2007. 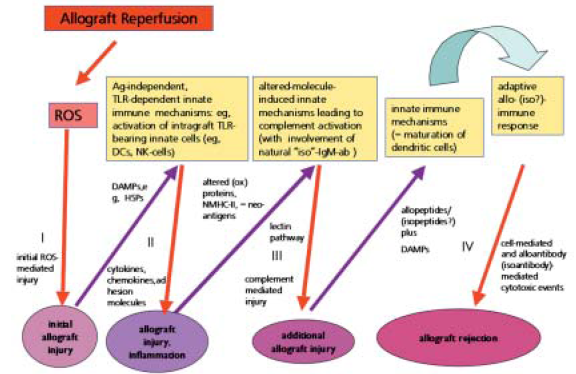 Figure 1: Chronologic dynamics of reperfusion injury-induced destruction of an allograft as a multifactorial process: The process is initiated by a primary direct oxidative attack, followed by generation of DAMPs, which bind to Toll-like receptors and activate intragraft innate cells such as dendritic cells. These cells, once activated, create an inflammatory milieu in the graft that may aggravate the ROS-mediated injury simultaneously or subsequently. The transplant tissue injury is associated with generation of altered/damaged molecules, for example, altered peptides in terms of ischemically induced neoantigens. Binding of highly conserved natural IgM antibodies to these neoantigens ultimately results in MBL-mediated activation of complement that contributes to further transplant damage associated with generation of DAMPs, release/generation of allopeptides, and altered isopeptides. Finally, intragraft dendritic cells become activated and mature, representing a bridge to subsequent adaptive alloimmune processes. Figure 2: Schematic illustration of intracellular TLR-triggered signaling pathways resulting—via activation of transcription factors NFκB, AP-1, and IRF3—in the expression of innate genes involved in inflammation, antiviral responses, and maturation of DCs. The innate immune response appears to be shaped like an hourglass, narrow at its center. Widening of the hourglass is achieved by generating ROS. The high intracellular concentrations of ROS generated during reperfusion injury and acting as second messenger molecules facilitate the signaling pathways via oxidant-dependent posttranslational modifications. The result is an up-regulation of transcriptional gene activation associated with an increase of the innate immune response. AP-1, activator protein-1; DAMPs, damage-associated molecular patterns; DC, dendritic cell; HMGB-1, high mobility group box-1; HSPs, heat shock proteins; IRF3, interferon regulatory factor 3; IKKε, IκB kinase epsilon; IKKs, IkB kinases; IRAK, interleukin-1-receptor-associated kinase; JNK, c-Jun-N-terminal protein kinase; LPS, lipopolysaccharide; MAPKs, mitogen-activated protein kinases; MyD88, myeloid differentiation marker 88; NF-κB, nuclear factor-kappa B; PAMPs, pathogen-associated molecular patterns; ROS, reactive oxygen species; TBK1, TANK-binding kinase 1; TIR, Toll/-interleukin-1 receptor; TIRAP, TIR-associated protein; TLR, Toll-like receptor; TRAF6, TNF-receptor–associated factor 6; TRIF, TIR-domain containing adaptor inducing INF- β; TRAM, TRIF-related adaptor molecule; iDCs, immature dendritic cells. Figure 3: Schematic illustration of DAMPs generation as a consequence of different kinds of cell/tissue injury, eg, reperfusion injury of different intensity: DAMPs may be either actively secreted from stressed, slightly damaged cells and/or released from apoptotic or necrotic cells (eg, HSP72, HMGB1). In addition, DAMPs may be generated from damaged extracellular matrix compounds as fragments (eg, hyaluronan, heparan sulfate, fibronectin). TLR4- and TLR2-bearing iDCs can recognize DAMPs. After recognition, the cells mature (ie, mature dendritic cells), activate naïve T cells, and lead to the development of adaptive immunity. Figure 4: Schematic illustration of innate immune pathways involved in innate alloimmunity development. The colored molecules represent molecules discovered in experimental models of either reperfusion injury or allografting. Experimental evidence suggests their role in the development of either full-scale reperfusion injury or allograft rejection. 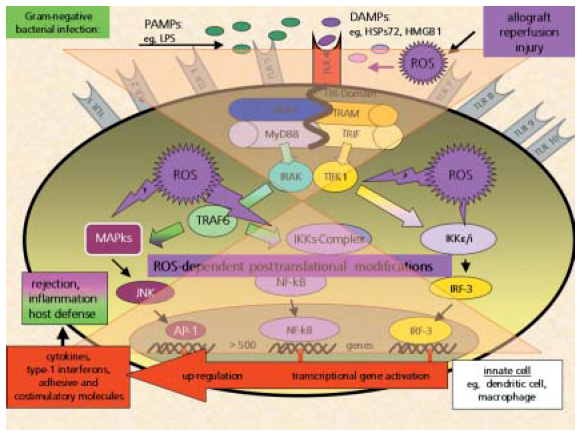 Obviously, the “road map” of these signaling pathways is incomplete (gray-colored molecules).